On Monday morning we found what looked like teeny tiny little poopies in the downstairs hall. Nowhere else, the boys seemed fine so we left it as a mystery. 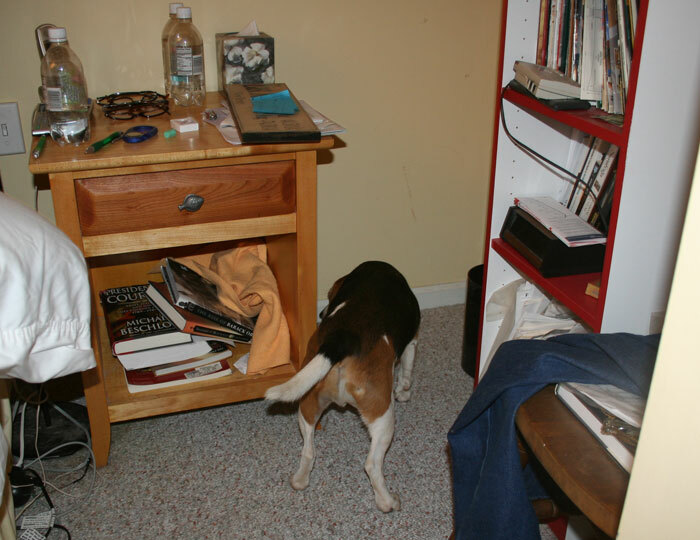 Fast forward half an hour and Stanley took his sniffing into overdrive, under the bed and nightstand, in the corner. “There must be something under the bed,” Phillip said, as I edged closer and closer to the door. He knelt down, took a look…and saw a BUSHY tail. “Ohmygod, I think we have a RAT!” he blurted out. Should we move to New York or Pennsylvania, I thought. Phillip went downstairs and came back with two sheets of plywood, picked up the wastebasket and requested a large pot which I was happy to supply because it got me out of the bedroom for awhile. “It’s a baby opossum!” he said, “It’s so cute!” It kindly came out from under the bed and ran into the wastebasket, which Phillip covered with the pot and took outside to freedom. So obviously the poopies were from the baby opossum who had come into the house through the sliding glass door we forgot to close the night before. But STAIRS?? Where did the baby opossum take classes in STAIRS?? 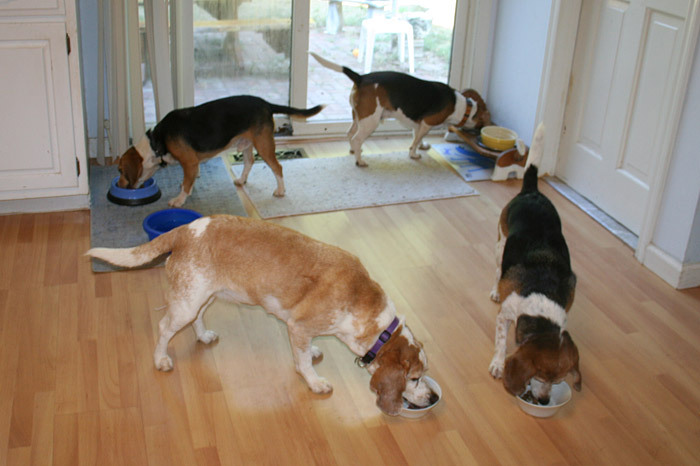 If you remember back last week, the four beagles treed an opossum and Tootsie killed it. This one was more fortunate, but I sure wish they’d all get out of town. To New York! Or Pennsylvania! 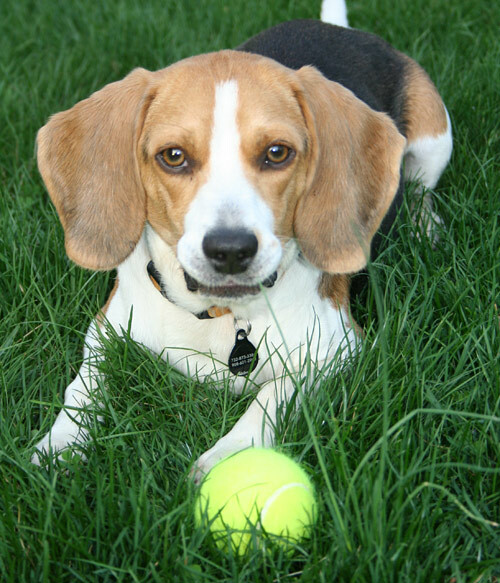 What’s going on when four beagles begin to shriek simultaneously (at 9:30 pm) while running around a large tree with their noses IN THE AIR? Did you guess correctly? That’s right, the beagles treed a baby opossum that was not smart enough to stay in the tree because Tootsie managed to grab and kill it. Did I mention that Sherman killed two more baby birds a couple of weeks ago? Sigh. A part of me (albeit a small part) is looking forward to winter and all the hibernations that go with it. 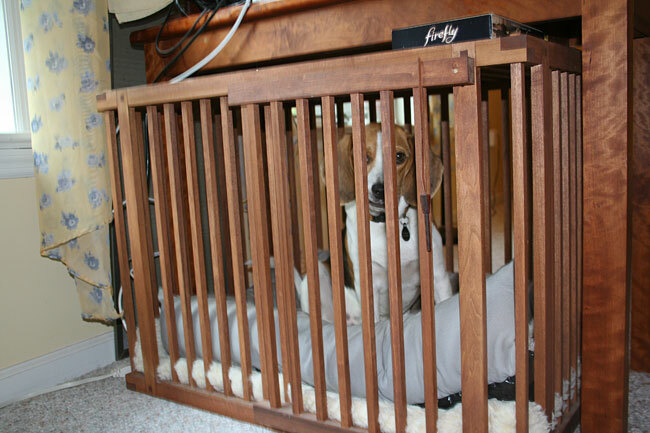 A certain dog is sleeping in his lavishly appointed crate this week. Last night, as we were commenting on how Mr. Destructo-boy was spending more time inside, we heard his hunting shriek and went out to investigate. He was in dense bushes, pretty much impenetrable by us, and was trying to climb. It looked cute until he came out with a newborn bird in his mouth. He brought the bird to a spot on the lawn, dropped it, then sat down next to it. Suffice it to say that Phillip had to euthanize it. Very sad. Then Phillip left for an evening meeting and not five minutes later the whole thing was repeated, except it was me who was responsible for the bird. I didn’t feel good the rest of the night. Sigh. No more golf balls (thanks, Rebeca!) for the Stan. Which is not to say that he isn’t getting in trouble. 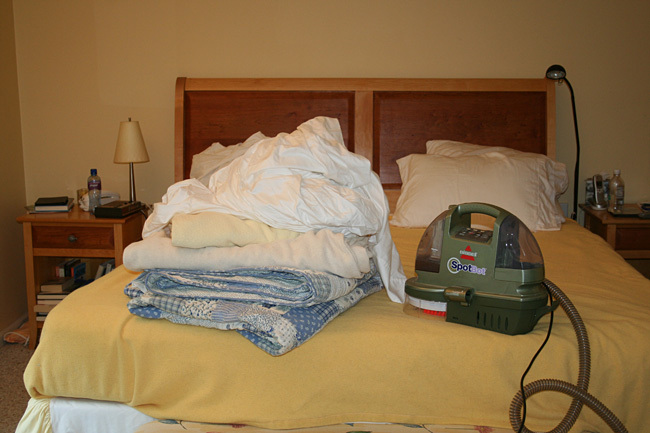 We’re packing for a scuba trip next week and I’ve tried to keep the door to the guestroom shut, but have not always been successful. 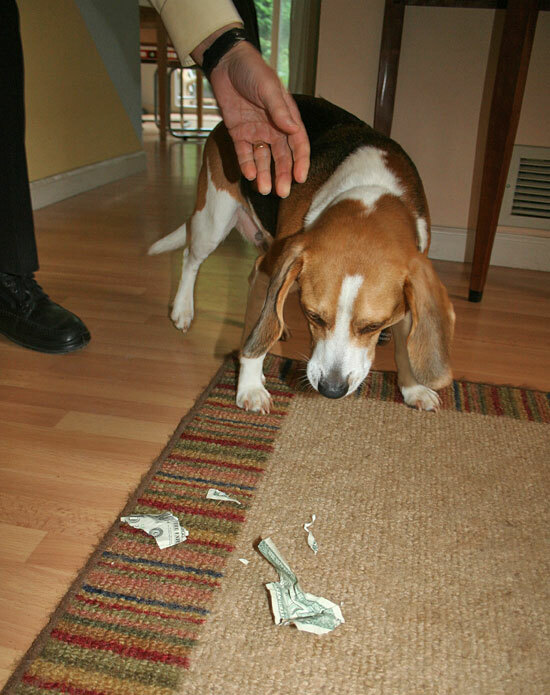 The other day he brought something downstairs and the noise he made chewing just didn’t sound right, so I got up to find my 25-pound beagle munching on an envelope containing $500. And then while we were packing yesterday he started to chew on my regulator. That’s the piece of gear that lets you BREATHE while you’re underwater (important!). Stanley, what are we going to do with you?? While Phillip has not gone cold turkey on the Diet Mt. Dew, his beverage of choice these days is this store-brand flavored bubbly water. 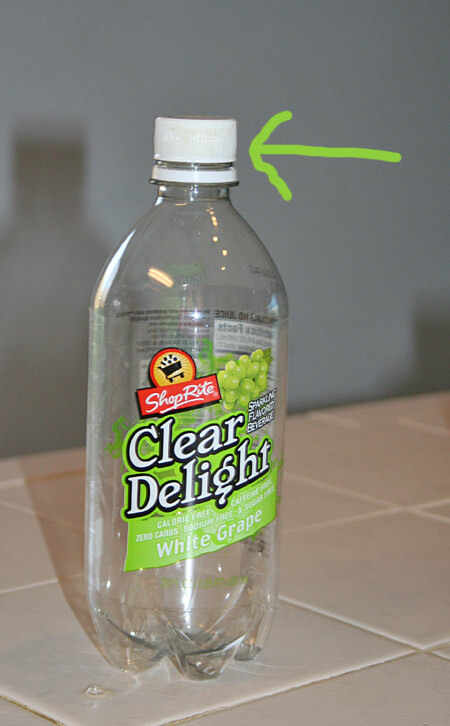 Therefore, there are usually several empty or near-empty bottles floating around and twice as many caps. Stanley likes to chew on the caps. The sound is quite distinctive and as soon as I hear it I grab him and yank the cap out of his mouth. But when Phillip heard that distinctive sound the other night he was unable to pry open Stan’s jaws. “Bring me a treat,” he called. Which I did, but instead of trading the cap for the treat, somehow he managed to swallow both of them. I thought to myself, “this must be a dream and I can wake myself up!” but of course I couldn’t. So I called the vet. 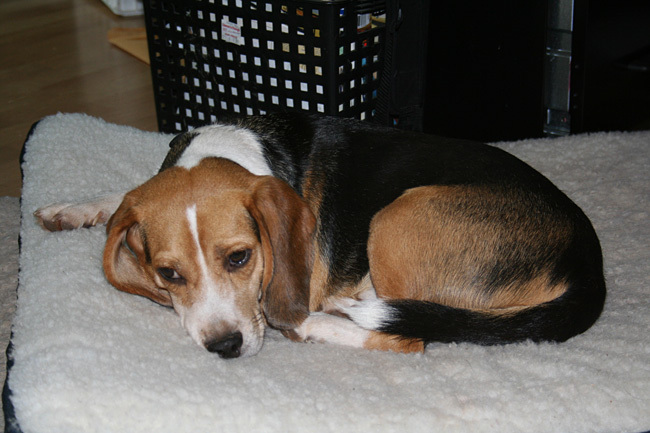 Who said that we could bring him in and they’d x-ray him or we could monitor for signs of vomiting, pain, etc. Frankly I didn’t want to do either! The x-ray would only identify the bottle cap and how long would we have to monitor him? Days? Weeks? What would I tell my boss? And how was a bottle cap going to make its way through the intestines of a 25 pound dog? He looks like a good little boy, doesn’t he? Don’t believe it for a second. So Phillip called our vet friend who suggested that we make him throw up. Throw up a bottle cap? How? I dug out the bottle of hydrogen peroxide I had in the doggy medicine shelf but it had been there for years and when I opened it it was completely flat and devoid of odor. So Phillip drove to the store and got two more bottles. Which also seemed rather flat, but we administered it anyway, several times, to no avail. So I went out to get even more hydrogen peroxide. But just after I returned, we had liftoff. 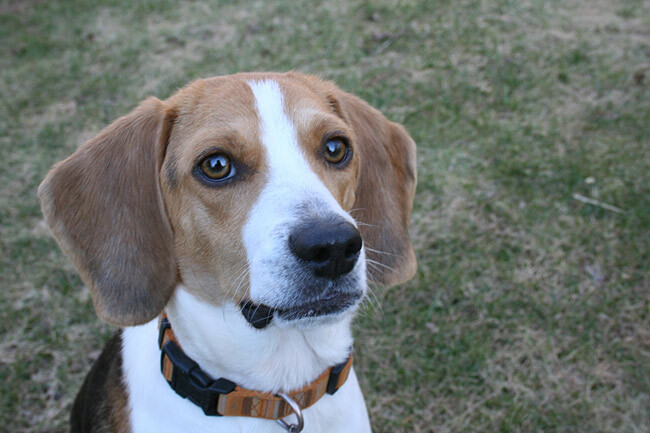 Stanley vomited the entire contents of his stomach: supper, carrots, treats, and miraculously, the bottle cap. 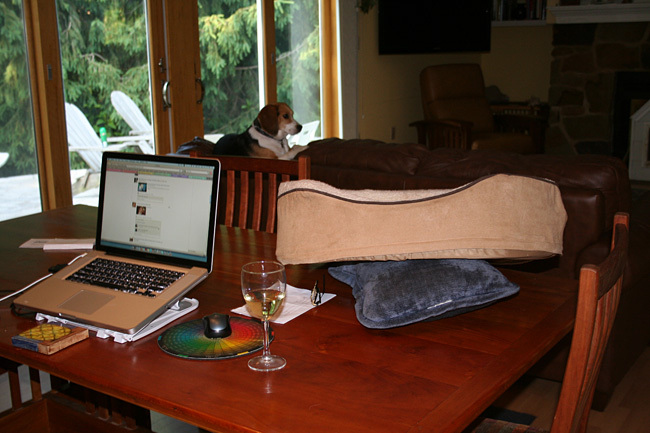 Sometimes I have to remind myself that we have beagles. 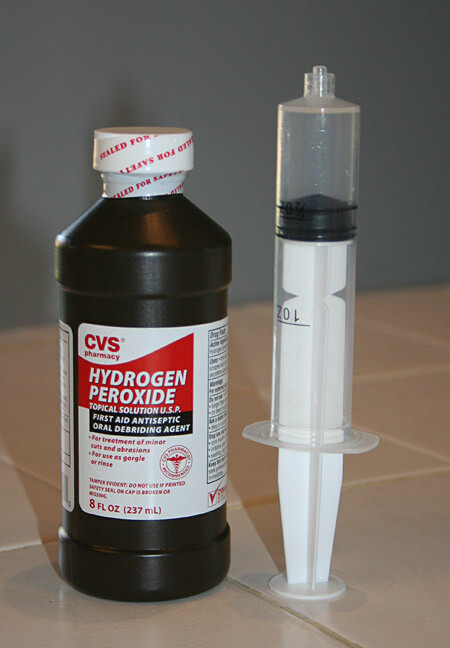 Now, your homework is to go out and buy a fresh bottle of hydrogen peroxide and one of these syringe thingies (or a turkey baster) in case you need it. Hopefully you won’t have to thank me!